We put our carpets through a lot. From everyday wear and tear to your child’s latest science experiment gone wrong, the carpets have overcome many obstacles. But as carpets endure these stains and messes, they need a little bit of special attention. So when your carpets are in need of some shine, call KIWI Carpet Cleaning in Shoreacres, Texas! KIWI Services has been cleaning carpets since 1987 and can make your home shine again. We are a trusted name in the industry, so you know your home will be in great care. KIWI wants to protect the interests of your family and the environment. That’s why our carpet cleaning solution contains only all–natural ingredients and is 100% safe for kids and pets. KIWI also only uses the dry carpet cleaning method, which dries in about 15–45 minutes and produces no wastewater. KIWI’s services not only make your home beautiful, but they are easy on your wallet with the KIWI Lover One–Year Carpet Cleaning Service. 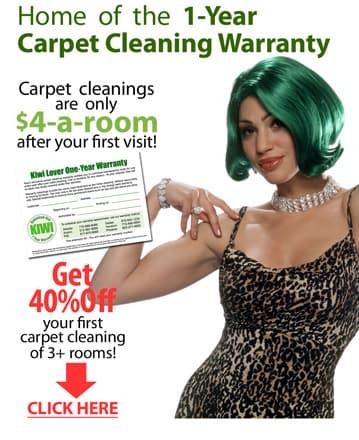 Customers who spend $120 or more on their initial carpet cleaning are automatically qualified for the warranty, which gives unlimited carpet cleanings for a year for just $4 per room plus a $37 trip charge. That means we’ll come back for any spill, any time. Just call Kiwi! To schedule or to get more information about carpet cleaning in Shoreacres, call the Houston area KIWI Services Center and speak to one of our representatives!